You’ve probably heard of the overzealous Olympic Games “brand police” harassing old ladies making Olympic cakes and other shop owners getting into the Olympic spirit, but how about the “Wi-Fi police”? The Olympics brand is the second most valuable brand in the world at $US45 billion. Sponsors pay tens of millions of pounds to the International Olympic Committee (IOC) for exclusive rights to spruik their wares around London and beyond, and the IOC will stop at nothing to protect those revenue streams. BT is the “official communications services provider” for the Olympics and has 1500 Wi-Fi hotspots at Olympic sites, with prices starting from £5.99 for 90 minutes. It’s the largest single Wi-Fi venue installation in Britain, according to BT. To protect this lucrative deal – and presumably minimise any potential technical interference – LOCOG, the London Olympics organising committee, has banned “personal/private wireless access points and 3G hubs” from Olympic venues. Want to create a wireless hotspot on your smartphone so you can get online on your laptop or tablet in between matches? That’s prohibited, as are portable Wi-Fi hotspot devices. 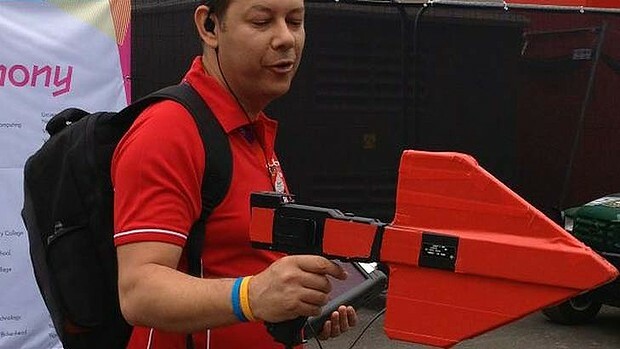 Sadao Turner Esq, director of new media for TV personality Ryan Seacrest’s production company, tweeted a photo of the “Olympics Wi-Fi police” that are charged with seeking out unauthorised Wi-Fi hotspots with big red detectors. The absurdities don’t end there. According to Britain’s Daily Telegraph, Fish and chip stalls have been advised they are not allowed to serve chips on their own without fish as McDonald’s is the official chip maker of the Games. The Independent reported that the ban on chips extended to 800 retailers at the 40 Olympic venues. Hundreds of uniformed Olympics officers have been patrolling London enforcing the multimillion-dollar marketing deals signed with companies such as Visa, Proctor & Gamble, Coca-Cola, Adidas, McDonald’s and BP. Only official sponsors who have paid a certain amount of money are permitted to use Olympic Games trademarks in their advertising. Under laws specifically passed for the London Games, the brand army has rights to enter shops and business premises and bring courts actions and fines up to £20,000. Words such as “Olympic”, “gold”, “silver”, “bronze”, “sponsors”, “summer” and “London” have been banned from business advertisements so as not to give the impression they are connected to the Olympics. Even pubs can’t have signs displaying brands of beer that are not official sponsors. LOCOG has previously said that the sponsor rights were acquired by companies for millions of pounds and this helped support the staging of the games. It said people who sought the same benefits for free by “engaging in ambush marketing or producing counterfeit goods” were effectively depriving the games of revenue. From a public relations perspective, this hasn’t played well with Londoners, who could breach the legislation simply by getting into the spirit of the games. Residents have also missed out on tickets only to see rows of empty seats in sections reserved for sponsors. Today they are reading rumours that just 15 Games organisers spent $70,000 on lunch. To see why Olympics organisers go to such lengths to protect sponsors you only have to follow the money. The Olympics brand is the second most valuable brand in the world at $US45 billion, according to a study by consultants Brand Finance. Apple is the only brand ahead of it, worth $US70 billion. Both maintain this value by going after anyone they perceive to be using their trademarks. The Olympics brand has increased in value by 87 per cent since the Beijing Games, largely off the back of a rise in broadcast rights – deals which punters complain are also preventing them from fully enjoying the Games. Ticketholders have also been told not to post photos or videos of matches to social networking sites. Matthew Gain, digital director of public relations agency Edelman, said there was a “fine line that needs to be tread” between the commercial realities and the ability of consumers to enjoy the Games. The Olympics are expensive to run and sponsors provide a chunk of the cash, so they expect that competitors won’t be able to get the same or similar benefits for free. “However at the same time you don’t want to protect that investment so much that you piss off everyone,” he said. So have organisers gone too far in this instance? “Some of the protection of the stuff in the UK where you’ve seen the local cake shop being told that they need to stop displaying the Olympic rings cake that they’ve made and put in the window is perhaps a little bit too far,” said Gain. “I think if it’s a mum and dad business that’s not really benefiting from the Olympics but getting into the Olympic spirit … that’s probably where you’ve gone a little bit too far.